TNA Impact! (official typeset "TNA iMPACT!") 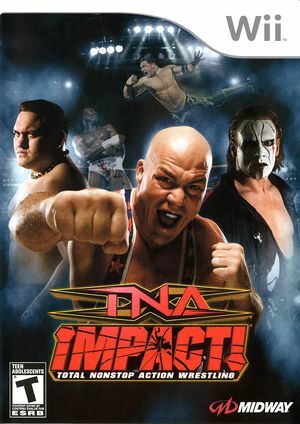 is the first video game released by the professional wrestling promotion, Total Nonstop Action Wrestling (TNA). The game was developed by Midway Studios in Los Angeles and published by Midway Games. Although the game sold 1.5 million units, financial issues at Midway Games prevented the planned development and release of a sequel. Shadows flicker during FMVs. Because Dolphin is only playing back a video, there isn't anything that can be done for this error. It was likely pre-rendered from the 360/PS3 version of the game, which likely had minor defects like this. The game has issues with audio looping. This happens on console as well. The graph below charts the compatibility with TNA Impact! since Dolphin's 2.0 release, listing revisions only where a compatibility change occurred. This page was last edited on 7 December 2016, at 01:11.